(Top) The TRES RV measurements of KELT-20b with the best fit model shown in red. The residuals to the fit are shown below. (Bottom) The RV measurements phase-folded to the global fit determined ephemeris. The predicted RM effect is shown at 0.25 phase. The residuals are shown below. Credit: Lund et al., 2017. The new planet was identified by a group of researchers led by Michael Lund of the Vanderbilt University in Nashville, Tennessee. The astronomers observed HD 185603 using the KELT-North telescope in Arizona to identify the initial transit signal of a potential planet. The observations were made as part of the Kilodegree Extremely Little Telescope (KELT) survey, which is dedicated to searching for transiting exoplanets around bright stars. The observational campaign was carried out from May to November 2014, and allowed the scientists to identify KELT-20b as an exoplanet candidate. Afterwards, the researchers analyzed archival data and conducted follow-up observations and high-resolution imaging of the object, which resulted in confirming the planetary status of KELT-20b. "We identified the initial transit signal in KELT-North survey data. Archival and follow-up photometry, the Gaia parallax, radial velocities, Doppler tomography, and adaptive optics imaging were used to confirm the planetary nature of the companion and characterize the system," the authors wrote in the paper. According to the study, KELT-20b has a radius of about 1.73 Jupiter radii and a maximum mass of 3.5 Jupiter masses. It orbits its host every 3.47 days at a distance of approximately 0.05 AU. The planet's equilibrium temperature is about 2,261 K.
The derived parameters of KELT-20b indicate that is belongs to group of planets known as "hot Jupiters." These exoworlds are similar in characteristics to the solar system's biggest planet, with orbital periods of less than 10 days. They have high surface temperatures, as they orbit their host stars very closely. The researchers emphasized that the newly discovered planetary system is extraordinary in several ways and that the planet itself is unusual when compared to other "hot Jupiters." "The KELT-20 system represents one of the most extreme transiting hot Jupiter systems, and indeed, one of the most extreme transiting exoplanet systems yet discovered by several measures. The host star is both exceptionally bright (V ∼ 7.6), and exceptionally hot (Teff ~ 8,700 K). It is only the sixth A star known to host a transiting giant companion. 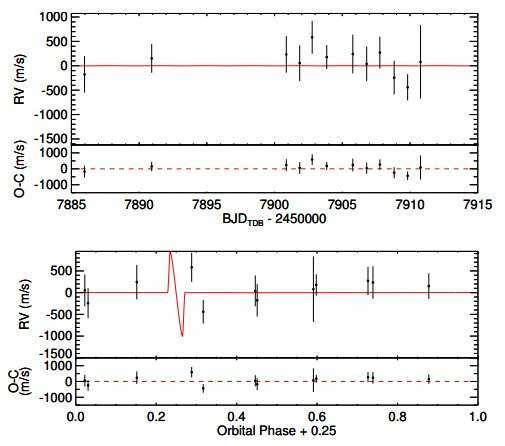 The planet itself is on a relatively short period orbit of P ~ 3.5 days, and thus receives an extreme amount of stellar insolation, resulting in an estimated equilibrium temperature of ∼ 2,250 K," the team concluded. They added that KELT-20b is a great example of a "hot Jupiter" suffering from extreme stellar irradiation, particularly in ultraviolet wavelengths. Therefore, the planet is an excellent target for detailed follow-up observations and characterization. They are a bit far away and hence may not be that much of a concern. Today's News reads that the 6800 sq.km Antarctica Iceberg after being watched for 1 whole decade has finally snapped!